.Function: Backyard Cinema is back Quentin Tarantino style. Nothing quite like the feeling of sitting in the cinema, the lights go down and you completely submerge yourself into the screen. At the Backyard Cinema you don’t have to wait till the film starts, your experience starts the moment you step through the door. 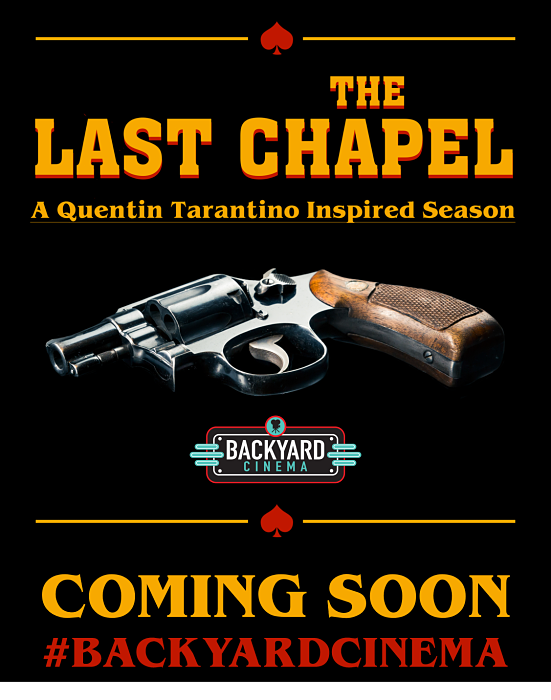 ‘The Last Chapel’ is the latest event created by the Backyard cinema. Darker, more theatrical set in an abandoned chapel, deep in the Nevada Desert(Borough, SE1) accompanied by a slightly unhinged priest seeking salvation, this cinema is the immersive homage to Tarantino you can’t miss. From the 23rd of March the screenings start with Reservoir Dogs and from there it’s all the best classics and inspired by the film legend Tarantino including Pulp fiction, True Romance, Kill Bill: Vol 1 and much more. ‘The Last Chapel’ will be held London’s Mercato Metropolitano. Dedicated to the theme, their house bar had to have a ‘From Dusk ‘Till Dawn’ inspired theme serving craft beer and special cocktails plus giant beanbags with blankets to cosy under. On the topic of creatives transforming your entertainment experiences, UK’s nightlife entrepreneur Nick House has ventured overseas to Ghana and teamed up with Jessica Patterson and YOLO experiences to renovate the traditional club experience at CARBON. The Luxury lounge-club guests shall enter a magical, mysterious world of luxurious hedonism, stylish surrealism and neo-nightclubbing. The club run entirely by women shall include interactive art installations, fire-dancers, vodka-infused mists and giant golden Gummi bears guarding the doors. The time for breaking out of the ordinary experiences is now; make sure you’re part of it.